Today was craftapalooza at our house…..so named because I had five extra girls and one mom at my house to make valentines. Yes, you heard me right, I had a total of 7 girls 5-9 and another mom and Henry at my house today. The picture to the left and the picture below show my dining room table covered in the various and sundry items used in making the valentines. 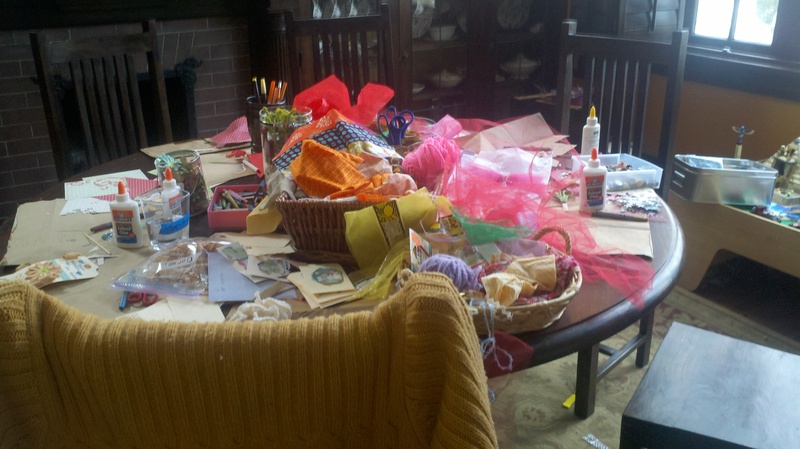 The girls all go to a school where they are to make the valentines…no store bought crap for this crew. So, I felt like we would take the opportunity to get a jump on the Valentine making since I had to keep two of the girls today anyway. The girls had a blast. 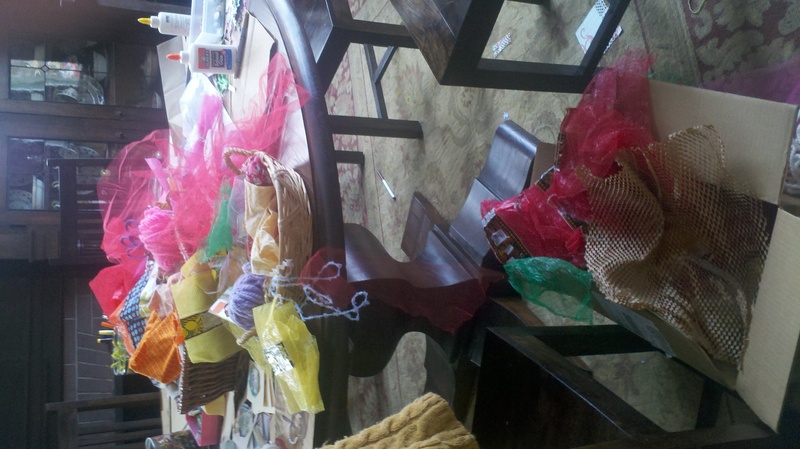 Besides the Valentine making, the girls helped make pompoms for the knitted farmyard as evidenced later in the post. They had more fun making them for themselves, but I did get a few out of them for the farm. They also had lunch, hid in the back bedroom and whispered, ran around like nut cases and had various little girl dramas all day. All in all, it was a lot of fun. This is the photo of our dinner. 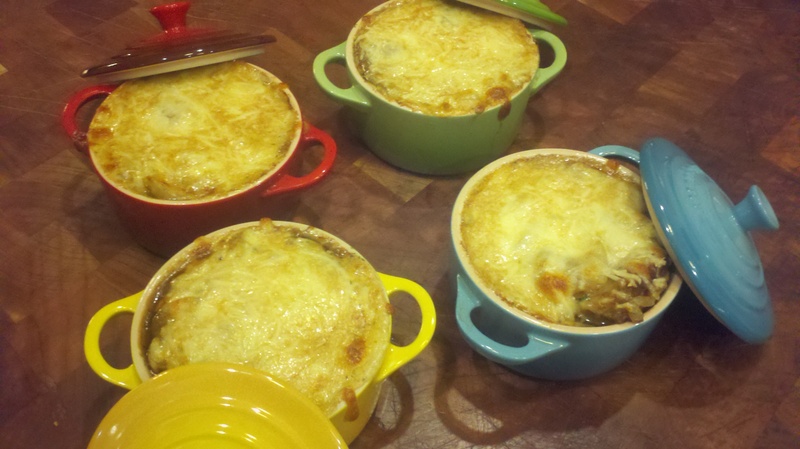 I made homemade French Onion soup and used my homemade bread for the toast layer. Mycah had two bowls, so did Henry. Grey had a bowl and a half. It was a big, big hit. Henry was a little suspect of the idea of French Onion soup. He likes it, but everywhere we have the soup it is way too salty. I knew his objection because I have the same one, so Mycah and I both tasted the soup BEFORE adding salt and then added a little at a time until it was perfect. Henry had bought me these little crocks the other day when I mentioned for the second time that I sure would like to have them. The girls loved having their own crock with a lid and everything. I used the Mark Bittman recipe out of How to Cook Everything. Lori turned me on to him a few months back and I bought his book. It is great. The recipes are really good and he discusses substitutions for seasonality, explains lots of things I had not know and give lots of variations for most of the recipes. i also bought How to Cook Everything Vegetarian based on my happiness with the other book and it is a winner too. 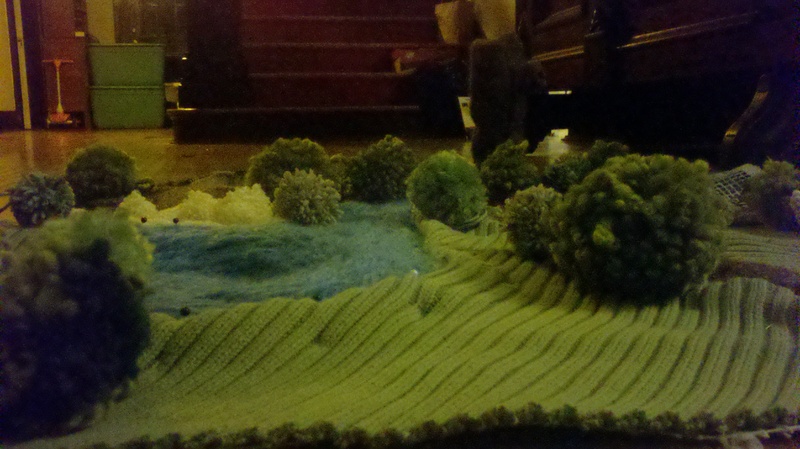 These last two photos show the progress on the knitted farmyard. 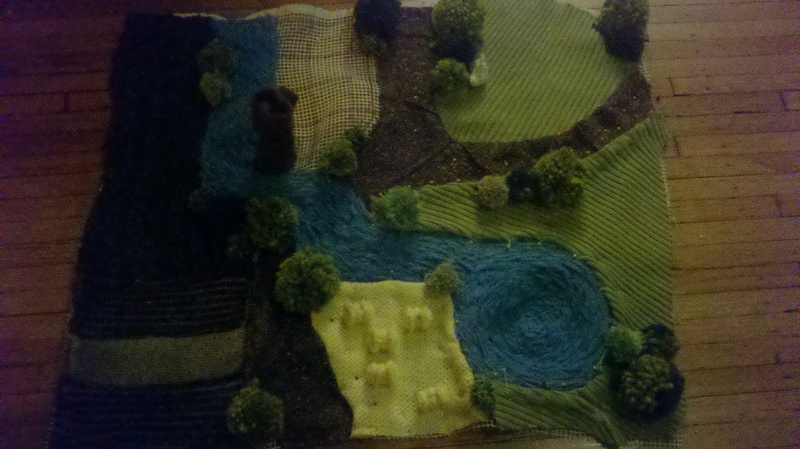 Henry made the little hay bales for the field of hay. I love them. I have pinned down the additional fabric for the hay and the grass. The blank spot will be the only latch hooked area as latch hooking doesn’t agree with me. The pompoms are little bushes. They are not sewn down yet. That will be one of my last things. I have made one chicken and am still working of the dad. The knitting part of the knitting farmyard should be the easiest for me, but it has turned out to be the slowest and most fiddley. It’s well on its way to being completed, so I will soldier on. Have a great, crafty evening and love to my family across the pond, in the burbs, on the ridge and in the hills of GA!